I believe that success starts with knowing yourself–and defining your version of the word. When we begin tapping into our authentic selves, we start to uncover what is unique to us. We begin to notice where we have deviated or fallen away from the path that is of our own design. And while perhaps different than what is expected, our idea of success–and our experience of it–is enhanced by our self-knowledge. When you step into knowing yourself, it is the beginning of the journey to owning and embracing your authentic self–and what you are capable of. This knowing is a huge key to capitalizing on positive contributions and appreciating what you can do for others. But knowing, owning, and embracing our authentic selves can be a challenge. There are barriers like competing expectations from within and externally. There are rules we have for others and ourselves about how we are supposed to show up. And some of us don’t want to do the work of self-reflection and discovery. Even for those interested in this process, life seems to have no pause button – when is there time to look inward, to ask the important questions? When you step into knowing yourself, it is the beginning of the journey to owning and embracing your authentic self–and what you are capable of. When we believe in the impact these efforts can have, we carve out the time to do it. For starters, we are much better equipped to succeed when we operate from a place of knowing what’s important to us and what our natural talents are. But major life changes are not the only reason to evaluate ourselves or “dream bigger.” Many people simply acknowledge that they can raise the bar on their successes during the course of everyday life. And entrepreneurial-minded leaders understand the necessity of leading themselves in this way. They just need some clarity around what direction to take. This is also where looking inward and knowing yourself can provide the answers–and the necessary actions–for greater success. Knowing what you want. The ability to evaluate opportunities and situations using your own unique criteria is critical to living authentically and moving in the direction of your success. This is done by identifying what I call your “Top 3” criteria for making decisions–or your litmus test. I offer a way to achieve this in a 15-minute call named the Better Decision Making JumpStart. Knowing what you do well. There are many ways to uncover this. My preferred tool is StrengthsFinder because it can show you what your natural abilities are. Then, by strategically applying (and appreciating!) your talents, they become strengths. I love working with entrepreneurial-minded leaders to help them fully leverage their talents, hone and execute on their ideas, and overcome the challenges they face. I typically do this with a Creative Partnering(TM) Engagement, which can be informed by the StrengthsFinder results. The intersection of what you want and what you do well is a powerful place. And it is a good foundational start to knowing your authentic self. As mentioned, I began my self-discovery process when I finished my cancer treatment. I was in limbo. I wasn’t sure what I wanted to do next, or what I was good at. So I flailed. A lot. I tried different things. Chemotherapy can cause what’s known as “chemo brain,” which made me feel not very sharp or organized. I was comparing myself to a past version of me–and suffering by comparison. At that stage, I had doubts about my value and abilities. I was in a space of rebuilding myself which took a little more than a year to get to a place of appreciating–and I feel I’m just starting this part of my authenticity journey. It’s an exciting place to be. And now that more time has passed, I’m starting to feel like I’m stepping into my strengths and leading with them–as well as managing expectations of self and others– as I told the Arizona Airports Association’s Spring Conference attendees this year. When we look at knowing our strengths, we gain confidence. And this confidence can lead to successes we had never before imagined. It can seem like a huge leap for some people. But the good news is, all you have to do is start with yourself. It’s what you have the most control over. That’s where the wealth lies. That’s the good stuff. When people believe they can be a better version of themselves by “amping up” who they already are–that’s powerful. It’s a great start to living an authentic life–and achieving success on highly personalized terms vs. traditional expectations. If you’re ready to start the knowing process for greater personal success as an entrepreneurial-minded leader, schedule your 15-minute Better Decision Making Jumpstart. 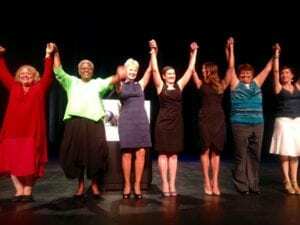 I also invite you to hear my story–and the incredible stories of 9 other women who will change what you believe about life after a cancer diagnosis–at A 2nd Act’s Survivorship Takes the Stage. UPDATE: The recorded talks are now live! Watch here.